I’m not sure how it started, exactly, our family’s The Walking Dead series obsession. I think it was the “Zombiefest” my boys had a couple of years ago around Halloween, staying up late with creep-themed foods and watching old, cheesy b&w zombie movies. 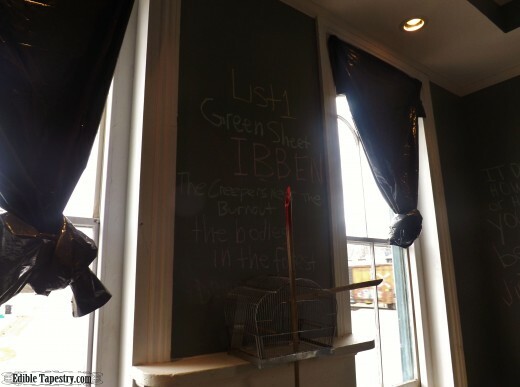 Thanks to the Zombiefest, (check out my 2014 Zombiefest party food ideas for a TWD premiere party) they begged us not long after to check out the first episode of TWD on Netflix to see if it was approved for them to watch. It was NOT. Ew! Yuck! Ick! It was horrible. We told our boys it was too gross, too violent. Then said next episode, please to the one holding the remote. 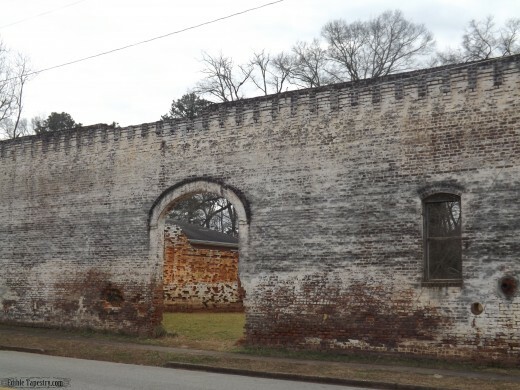 So that brings us south of Atlanta, after months of researching by yours truly, to a little town called Senoia, known to TWD fans as the evil “governor’s” lair of Woodbury. 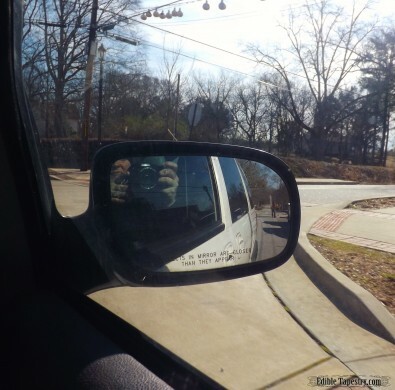 I used Google Maps The Walking Dead Film Locations markers to get us from place to place. 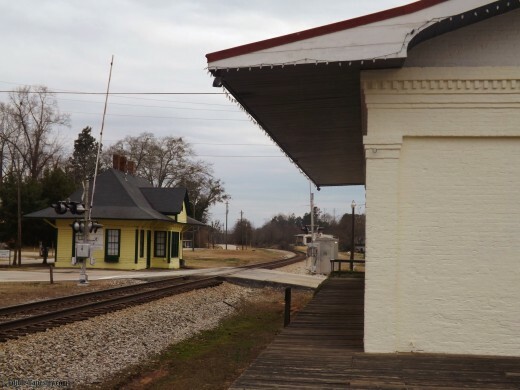 A circular route from I-85 down through Peachtree City and on to Senoia allowed us to explore and walk the towns that filming has been centered around in a nice self-guided tour of some of the major locations. Our route ended at Grantville, where the “Clear” episode was filmed. From there it was easy to catch I-85 to head back toward Atlanta. And now I need to post a SPOILER ALERT. This is for anyone who is catching up on the series or doesn’t want to see photos of the film locations. 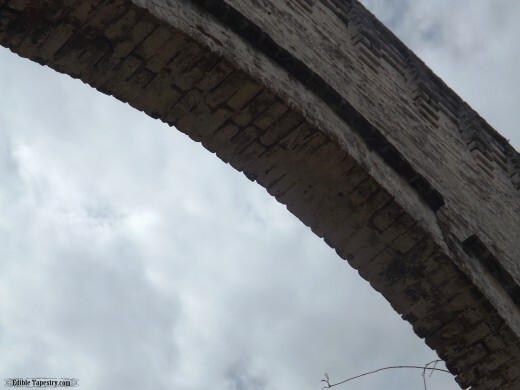 I have included pictures in this post of all the ones we found on this trip, with directions to some for those who don’t want to take the time to pore over every little detail of the Google Maps markers. I was surprised to find when I was planning this trip last year that there isn’t a very good app for the self-guided tour, though there are touring companies who, for a reasonable fee, will take guests on a 3 hour bus trip of some of the locations. Atlanta Movie Tours is one of them. 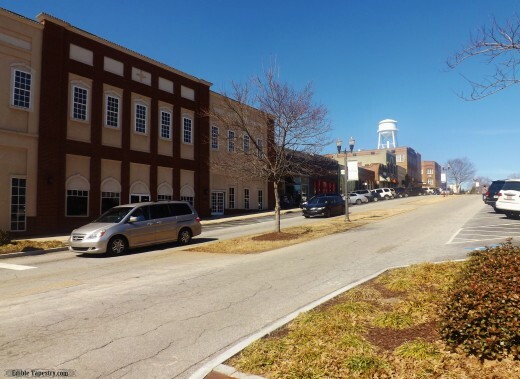 As soon as you pull into the small town of Senoia, Ga, even without the tire barricade and debris filling the streets, you know you’re in fictitious Woodbury. Though I did start imagining “Governor music”, I waited for a creepy tingle to work its way up my spine. 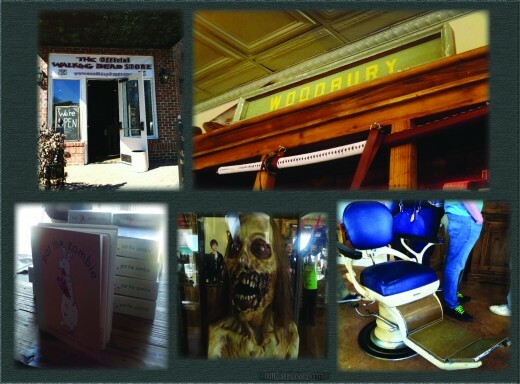 Truth is, Woodbury’s downright cute. Adorable even! Our first stop, where we hoped we’d find a Senoia TWD self-guided map of some sort, was The Official Walking Dead Store, also known as The Woodbury Shoppe. The main floor has all the t-shirts and tourist trap items that you’d expect, but also a few film props. 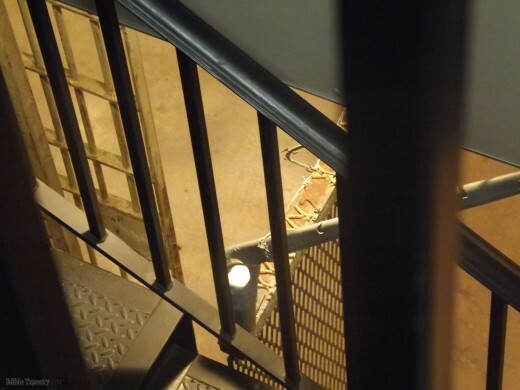 I don’t know what was going on down behind a chained off flight of stairs to the basement, but by doing a few yoga twisty folds I was able to hold my camera down at an angle with the lens zoomed out to get these shots. 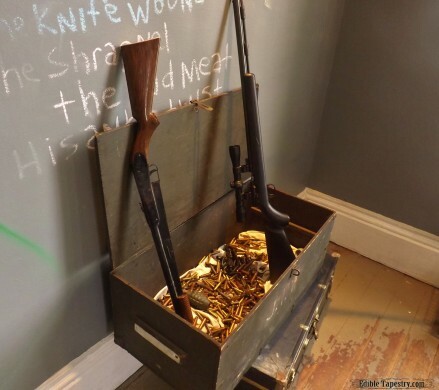 Actual film props? 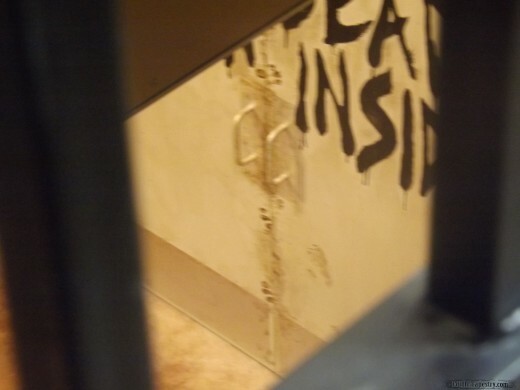 I don’t know, but what I saw was a jail cell and a set of doors that looks identical to the hospital “dead inside” doors that appear in the first episode of the very first season. We’re really hoping that is that case and a museum or addition to the store is in the process of being created. The store did not carry self-guided tour maps, but the store clerks were very helpful in directing us to two film locations right down the street– the house that Carl and Rick find shelter in while Rick recuperates from his final fight with the Governor, and “Chocolate Puddin’ House”, as it is called in our family. We found Milton’s lab on our own as we took a side road back to the main street of Senoia. 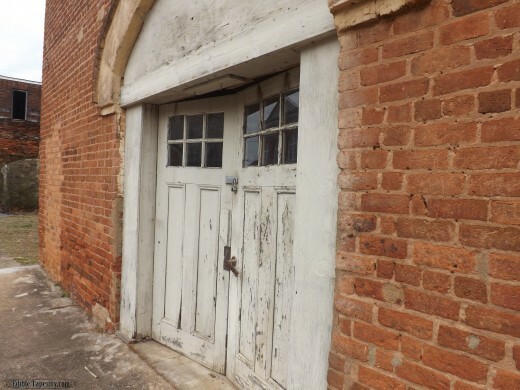 The town of Senoia is serious about saving their historical buildings and does so through the Senoia Area Historical Society. This makes strolling through the back streets of the little Southern city a fabulous occupation for anyone who adores old buildings. 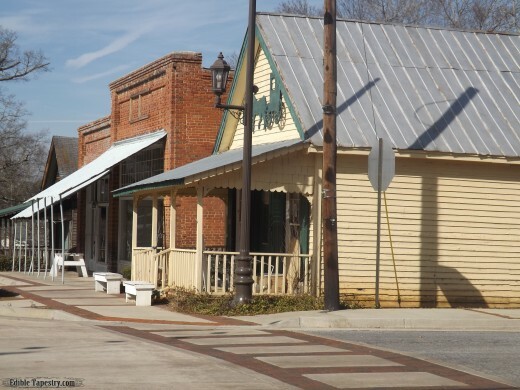 Senoia isn’t just the site of film locations in The Walking Dead series, many movies have also been filmed in the charming little town. 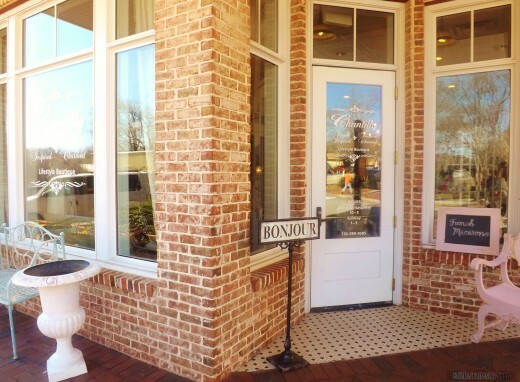 Bronze plaques, like Hollywood stars, are set within the brickwork of Senoia’s city sidewalks. 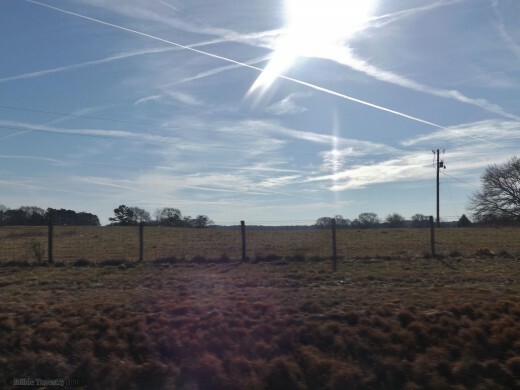 After a drive around with our jaws hanging while looking at acres and acres of farmland, criss crossed by streams and back roads to nowhere, we headed back to town to find lunch. 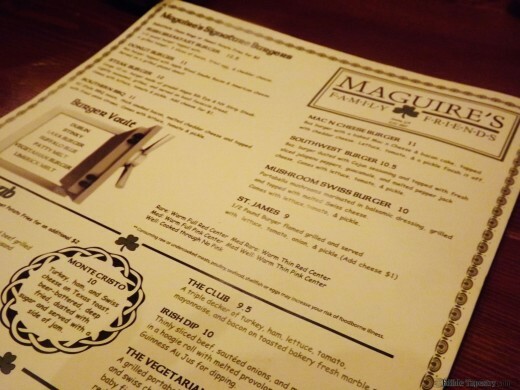 There aren’t many food service establishments in Senoia, but after we saw the sign for Maguire’s Irish Pub we knew we needn’t look further. 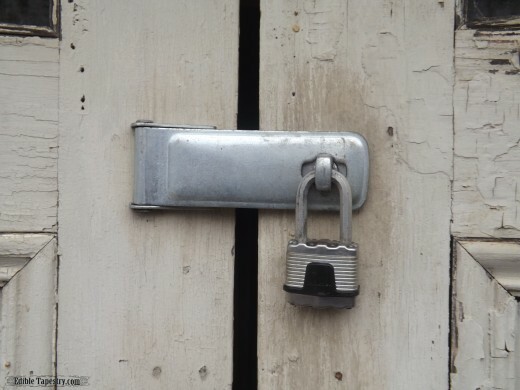 And once we opened the large wooden medieval door we knew we’d made a good choice. 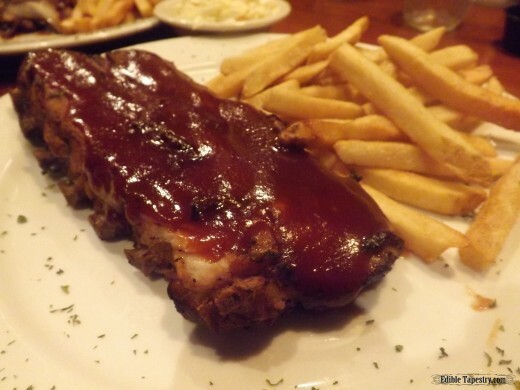 Because we were in zombie territory, my boys didn’t hesitate to order half racks of ribs so they could gnaw on some bones like walkers. I know. Ew. But one thing we know how to do in this family is get in the spirit of things. 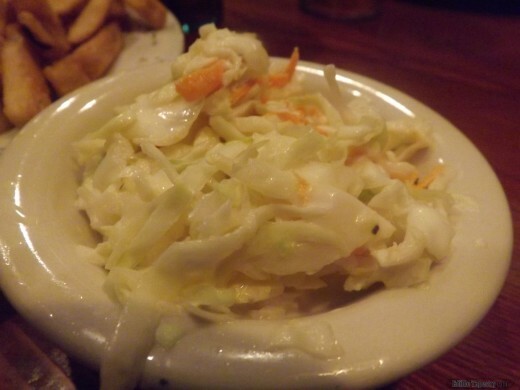 Perfectly sweet and tart coleslaw accompanied the barbeque. My boy doing his best living dead impersonation. Note the blank stare during the voracious attack. 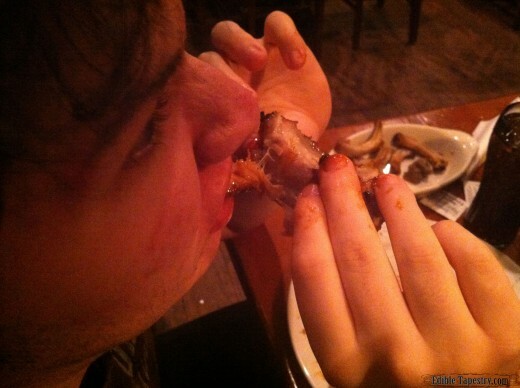 It looks like he’s really going to town there, but the meat on those ribs was so tender that it basically melted off the bone. Both of my rib-loving sons were exceedingly happy. I had the best bowl of Irish stew one can imagine, which came with a slice of Irish soda bread that was more the consistency of fluffy pound cake than the stiff loaves I pull out of my oven. It’s now my new mission to create a fluffy, currant-filled loaf like Maguires’. As it turns out, Maguire’s is the meeting place for sightseers who are signed up with Atlanta Movie Tours to take the bus trip. Most of the staff members are Irish, our waiter Theo told us. That would explain why the Irish food was so darn good. My husband ordered a reuben. Not exactly Irish, but all NYC, which is where we were told the Irish owners were from. And that must be why it was the best dang reuben I’ve ever sunk my teeth into. 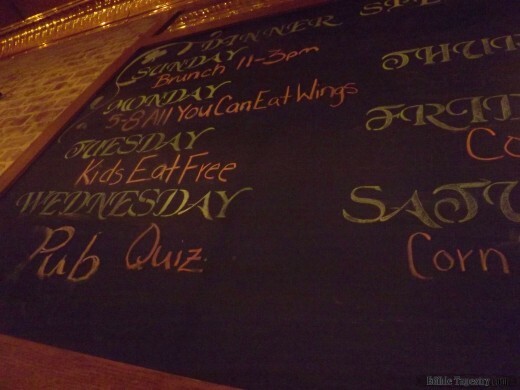 Yes, I nibble a little of everyone’s food when I find a restaurant that’s yummy enough to blog. I had one teensy corner of Hubby’s sandwich and didn’t want to stop. Wow! 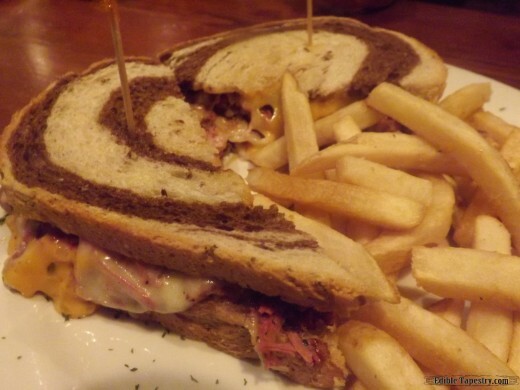 Marble rye, oodles of cheese and corned beef, just enough sauerkraut…perfectly toasted. I know exactly what I’m having the next time we eat at Maguire’s. And there will definitely be a next time because though it is around 3 hours from our home, it is certainly worth the drive down for another good meal. I wasn’t going to attempt dessert because I just didn’t think I could do it, but that Theo is a salesman, and I don’t mean of the pushy, used car variety. He just knows the menu and seems very familiar with the manner in which things are prepared in the kitchen. You end up saying yes, please before you know it when he’s making menu suggestions. Well, anyone who follows my blog or knows me personally is aware that I can rarely say no to bread pudding. I could eat it every day. This one I couldn’t finish, but if we hadn’t been on a road trip and I’d known for sure when next I’d have access to a refrigerator, I certainly would have taken it with me to save for breakfast…or my midnight snack. 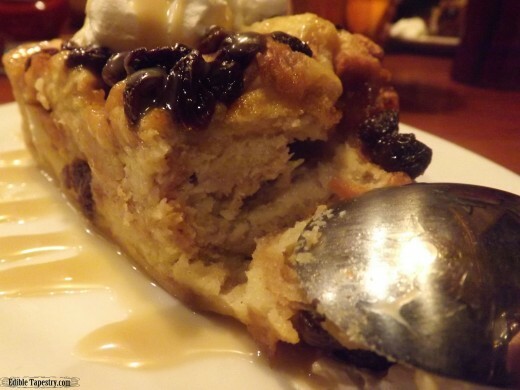 I adore a moist bread pudding that holds it shape and stands up on a plate. Bourbon sauce was drizzled over this one, which was made from all the leftover breads that are used in the restaurant. Excellent, from the back-of-the-house point of view of this frugal girl. We started our self-guided tour on a Sunday morning with the intention of doing half of our planned route in one afternoon so that we could be all settled in to a hotel room by the time the latest episode of The Walking Dead aired that evening. Everything was right on schedule and we arrived and checked into a room with enough time to spare for a swim in the indoor pool. Then we realized, to our horror, that the hotel had every channel in their line-up but AMC. We tried to find a way to watch it on the internet, but that was a bust as well. So here we were on a Walking Dead tour but were missing the new episode. Hilarious. The next day we had our free hotel breakfast, the kind with the flippy waffle maker, and headed out for another day of sightseeing. 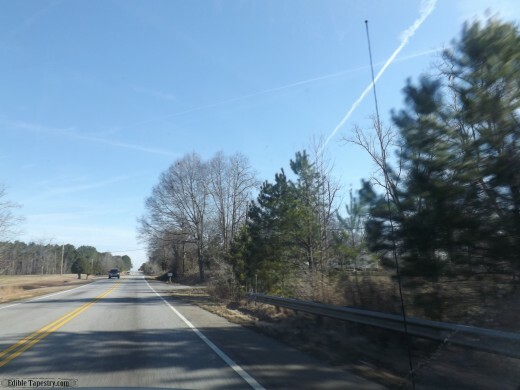 We went back to Senoia, then drove down from the little town to the intersection at State Route 16. We continued through the light to Luther Bailey Rd. 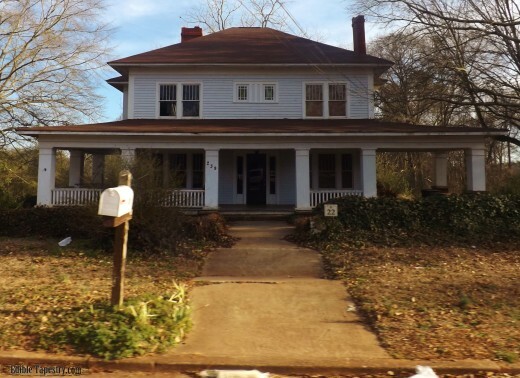 to pass the location where Rick and Shane had a conversation concerning Shane’s involvement with Lori and Carl. That incident was filmed at the intersection of Luther Bailey Rd. and old Highway 85. “Sofia’s church”, the church that was giving off a timed bell chime when Carol’s little girl went missing, is a little further down the road. 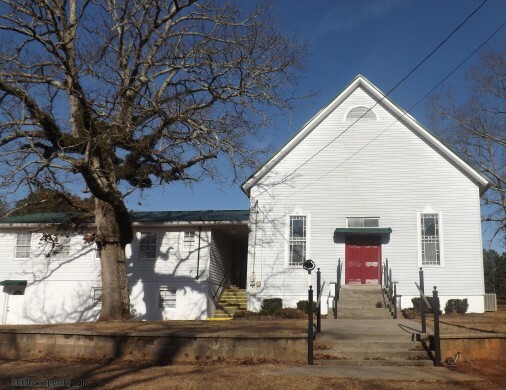 We didn’t check to see if there were walkers faithfully occupying the pews inside, but made our way back toward the highway in search of the house in which they looked for Sofia within the same time frame. This one we never found, so we assume it is in the forest and can’t be seen from the road. 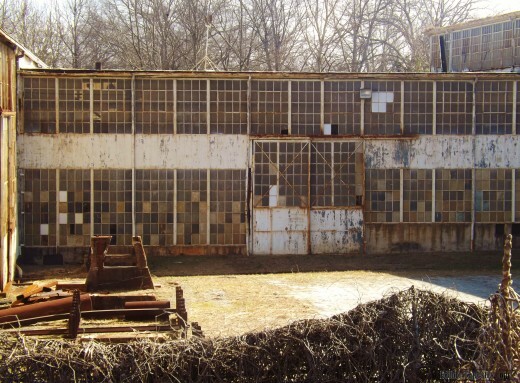 Hershel’s farm was next on my list, east on State Route 16 out of Senoia, then north on 85/74. I knew we wouldn’t be able to see it, as it’s on a large chunk of private property, but from the Google satellite image I was sure I had pinpointed its location. These three images are my best guess at where on the globe the farm exists. Approaching the drive to the farm. Looking in the direction of the farm, which I’m guessing is just over that rise. 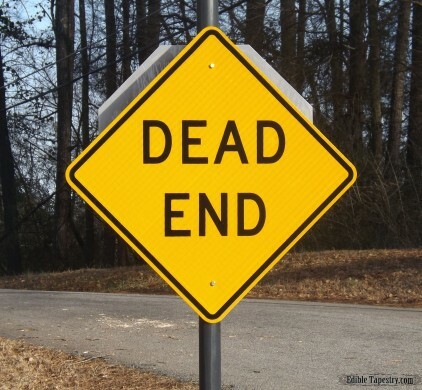 After trying to locate Hershel’s farm, we drove south back to 16 and made a left. 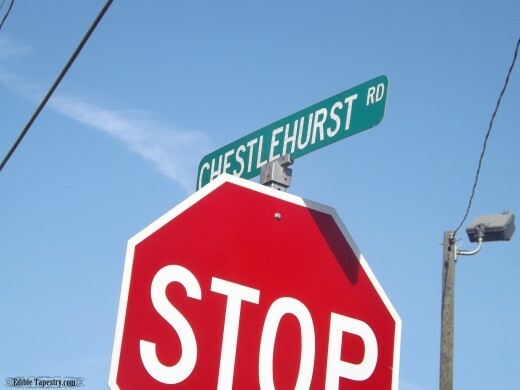 Another left, almost immediately, is Chestlehurst Rd. 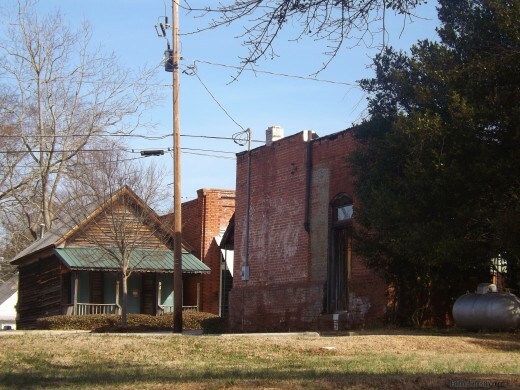 In plain view is the roadhouse from which Merle lures walkers with his car radio. On down the road is the prison. 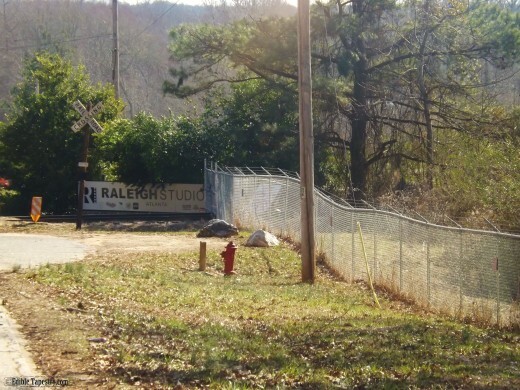 A prop lot is located to the right just before the studio sign comes into view. 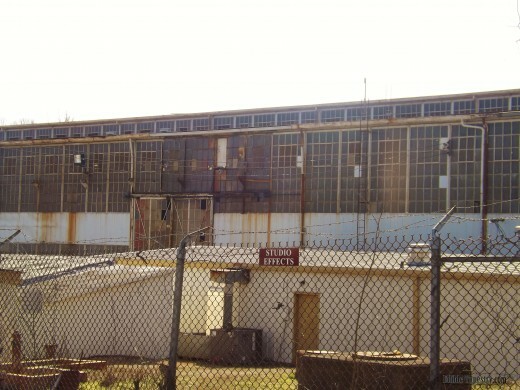 Though located on studio property, the rooftops of the warehouses that are used as the prison compound in the series are visible. 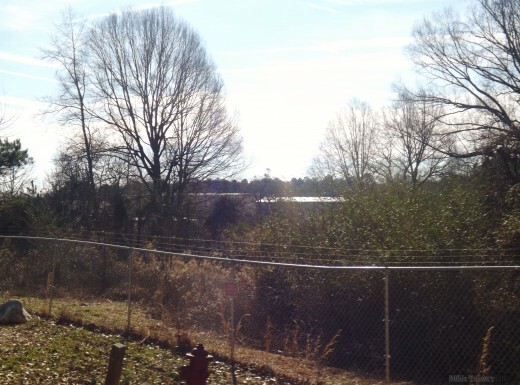 The dock and pond that the Governor stands on while looking down at one of his latest victim’s, Pete, is also located on studio property behind the prison buildings, according to Google Maps. We retraced our steps to 16, and this time headed west to take Rock House Rd. to Elder Mill Road. 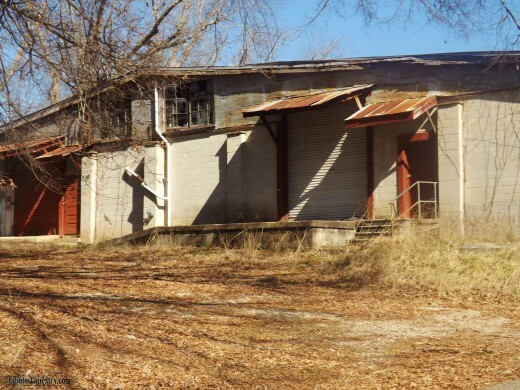 Elder Mill is the location of the scene in which Rick declares that if anyone wants to stay with the group, after they were chased from Hershel’s farm by a tremendously large herd of walkers, that they needed to know that the group “wasn’t a democracy any more”. 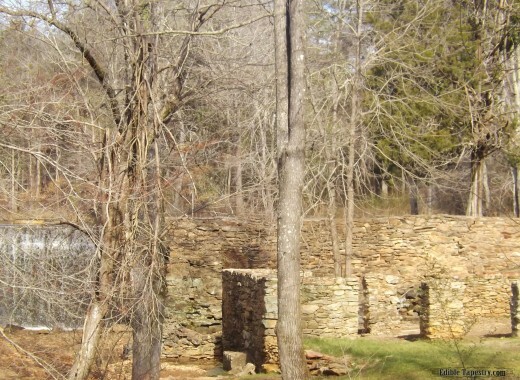 It should be noted that, while there are many group shots of TWD tour attendees at the mill floating around the web, Elder Mill is also on private property and cannot be legally accessed. We couldn’t even find a place to pull over for a good shot, so this one was taken on a second pass of the location by me from the passenger’s seat with my camera zoomed out through the driver’s window. A new fence has been installed across the front of the stone structure at the mill to prevent people from entering the access road. 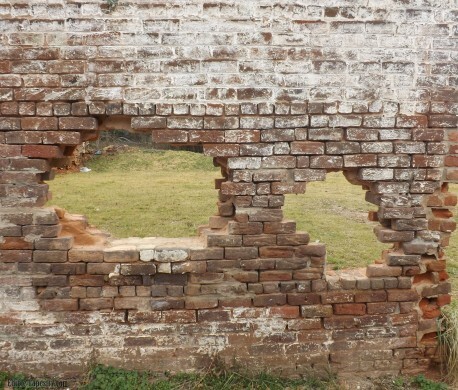 I was so disappointed, since I was certain that it was part of a park that we would be able to explore. After our short visit to Elder Mill, we again took State Route 16 west to Sharpsburg and the location of “Hershel’s Saloon”, where he goes when he’s finally had enough and turns back to drink after years of sobriety. 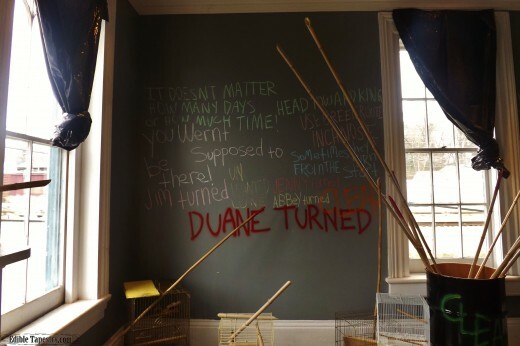 He’d had a pretty rough day after the walker barn incident, I certainly would have done the same thing! 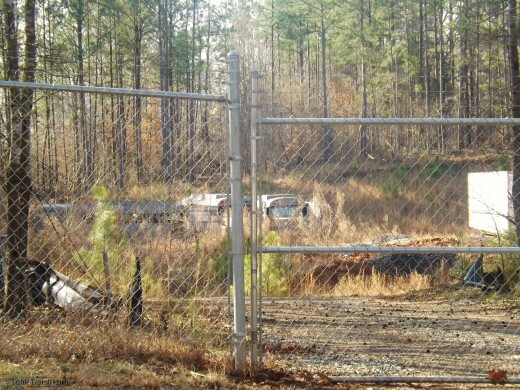 “Dumpster Alley” where Rick, Glen, and Hershel engage in a shoot-out with mercenaries from Pennsylvania. Across the street, one of the thugs, Randall, jumps from a rooftop and skewers his leg on the finial of a wrought iron fence post. Ew. After preparing to remove the lower portion of the boy’s leg to free him, Rick decides to save time, when walkers begin to surround the group, by jerking Randall’s leg from the post. Ouch! Directly across from the front of the bar is Steve’s Pharmacy. 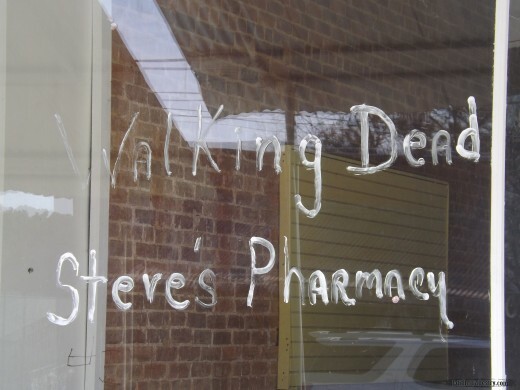 Inside this store, Lori gets a pregnancy test and Glen gets a surprise from Maggie. We hurried with our camera shots because, just like in the show, walkers were quickly approaching! We outran them and headed to Newnan, Ga and the Governor’s walker arena. And right here is where we missed our turn. We didn’t realize at the time, but if we’d been in the right lane when approaching Salibide Avenue we would have found the arena right away. 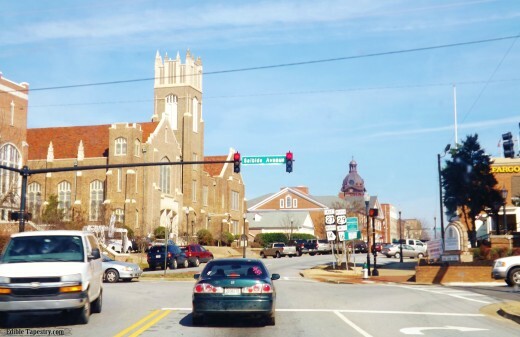 Fortunately, Newnan is one of those great Southern towns with a square. One road up, another road down. It was very easy to get back to where we needed to be. 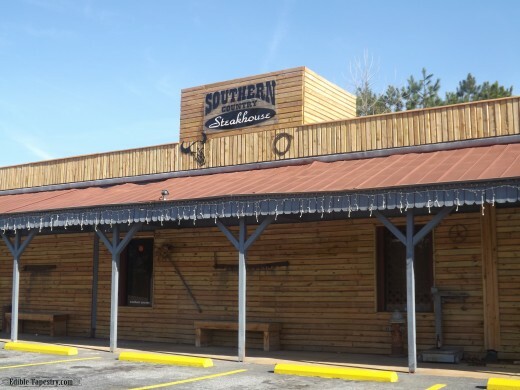 More on Newnan, and the great lunch we had there, coming in another post. Though a little lackluster in broad daylight, creepy nonetheless. From Newnan, we headed down I-85 for a few minutes, until we reached the Grantville exit. Tom Tom came in handy when it came time to turn onto the main streets of this virtually deserted town. It’s a smudge on the map, really, but the people of this area seem to be working hard to bring it to life. 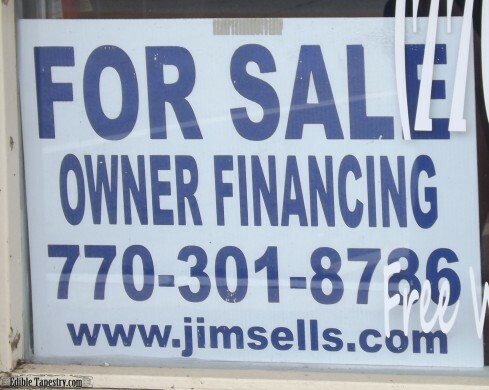 I’d read that the mayor, Jim Sells, owns a popular restaurant in Grantville in which the “Clear” episode is played for patrons. A walking tour of the town and film locations also was said to begin from the restaurant. This is what we found, however, when we arrived. Anybody want a restaurant? Dawn’s a sweetie. If you stop by Grantville, be sure to visit her for some inside info. on the town, current filming projects (Jim Carrey was just there. Let her tell you all about him. ), and how the locals can spot a tourist a mile away, camera around the neck and zombie t-shirt or no. We realized this first-hand when we were driving down a back road along the railroad tracks and passed a group of teen boys. One chomped his teeth at us like a walker, and of course I didn’t have my camera ready. Official Grantville walking tours will not be scheduled again until March 1, 2014, so Dawn had us call the mayor for a tour. He was busy but sent Kimmie. I don’t know who Kimmie was, maybe a relative, but she came and showed us around Morgan’s apartment. The building has been recreated to look as it did in the “Clear” episode. Watch out. 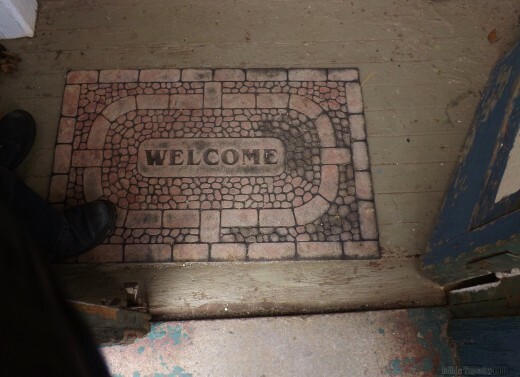 This door mat is the real thing, left from filming. Fortunately, there was nothing but solid ground beneath it. 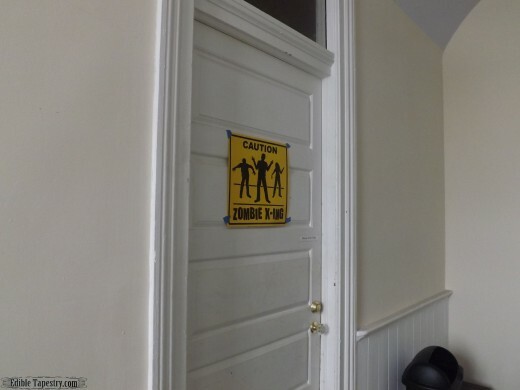 It cracked me up that the sign over the doorway has been hung for effect but edited for tourists. I love trains!!! This engine came rolling through while we were up inside the building. Whoever was on the building’s props/renovation project did a very good job. Being in Morgan’s apartment makes you feel as if you are in a post, post-apocalyptic world, especially since Grantville is virtually a ghost town right now, and has a creepy vibe all its own. I love the next picture because in the “Clear” episode, Morgan is on the roof firing down at Rick. 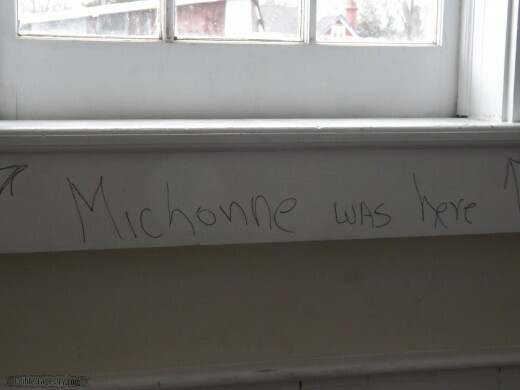 Michonne tells Rick that she’s sure she can get up on the roof, and then the next second she pops her head out over the edge. I find that so funny because it’s just impossibly quick, but when Michonne does something like that, you may giggle, but the next second you are thinking that if anyone could pull that off, she could! What a fabulous character! 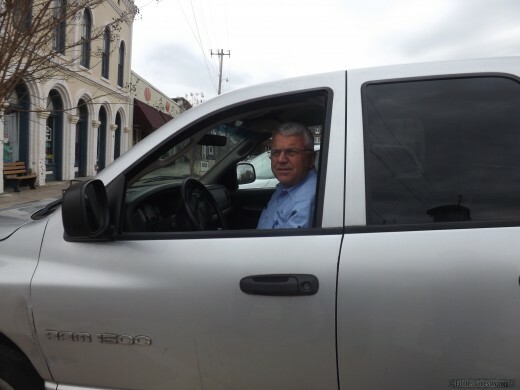 Mayor Jim swung around a few times in his truck while we were strolling through town to give us more information on locations when he thought of something else he wanted to tell us. He even got out to let me take a picture of him with my boys, one that will remain in my personal album because I don’t usually post photos of my children here. But it was just really nice, and it made us laugh every time he pulled back around. 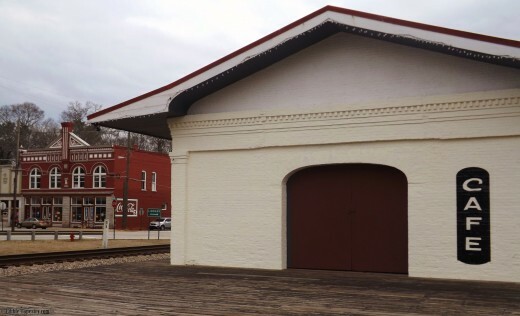 The train depot is the building that was used for another of Michonne’s “sleight of hand” moves, the cafe in which she salvages Carl’s family photo from an overbearing group of excited walkers. 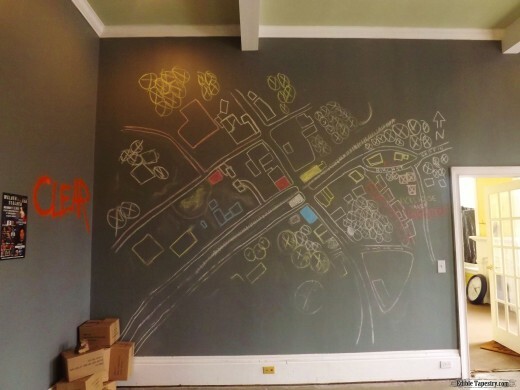 Mayor Sells told us that “the next time we come” to Grantville, the “cafe” will be repainted as it was in TWD. Now I have to go back for pizza, meatballs, and to see the finished cafe. I can’t wait! 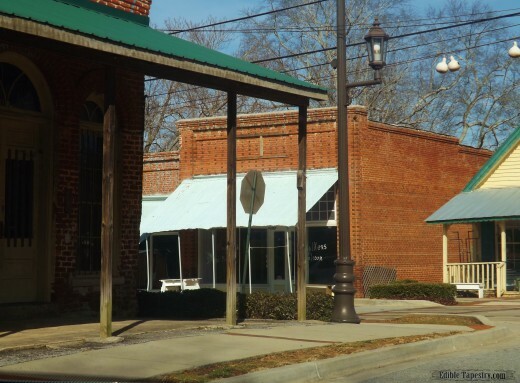 From this vantage point the camera captures Rick, Carl, and Michonne entering town in the series. And I’m REALLY glad I wasn’t standing there taking this picture when the train came through. That would have scared the bejeezes out of me. 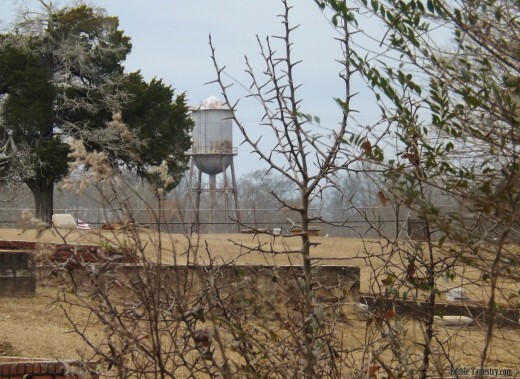 Other places around town look as if zombies really are occupying some of the deserted spaces. I can see why the producers chose Grantville for filming. Stand in front of this set of doors long enough and you just may imagine that half-decayed fingers will start reaching out for you at any moment. 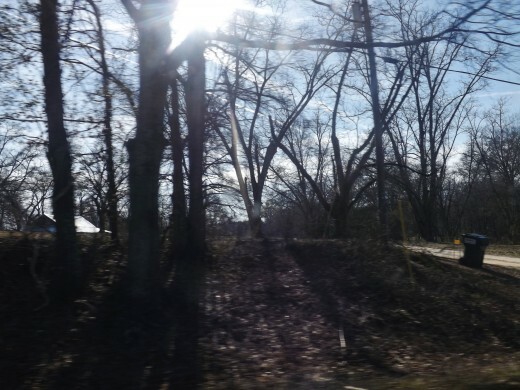 Morgan’s “clearing” field, the site of an old cotton mill, is pretty eerie without walkers piled inside. 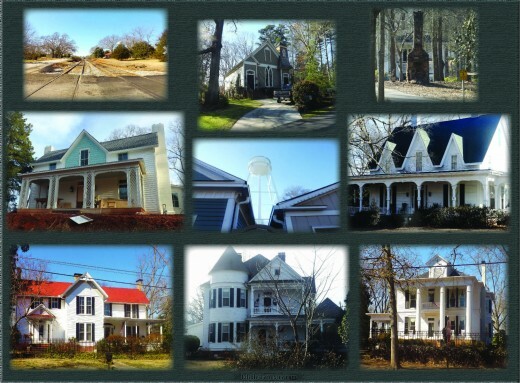 And though I hope that this entire post is useful to anyone who wants to make their way around some of the Walking Dead film sites, I’m not putting the Grantville photos in any particular order or adding directions to locations here, because I want anyone who is interested in visiting the town to stop by A New Dawn and buy a map or a tea cup, or use the potty, or just show your support for a township that is making an effort to grow and come back to life. Meatballs are always a good idea, so save room for a trip to the town pizza shop. Now here are some major spoiler photos, though we were only given a little information on the events surrounding the actual sites in the series. 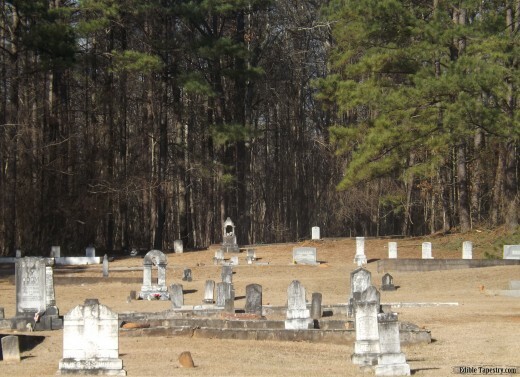 Mayor Sells directed us to “the funeral home” that will be important in an upcoming episode, and the Grantville cemetery, which is also a film location that will appear in the series later on. 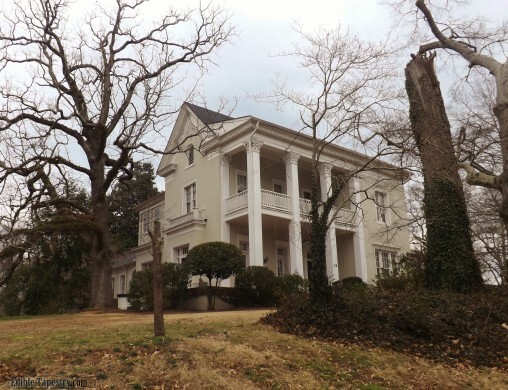 That is all I will say, but if you visit Grantville and the home that is depicted as the funeral home in a future episode, it is very important to the owners that if you want to take pictures of the house, you remain in your vehicle to help them maintain their privacy. 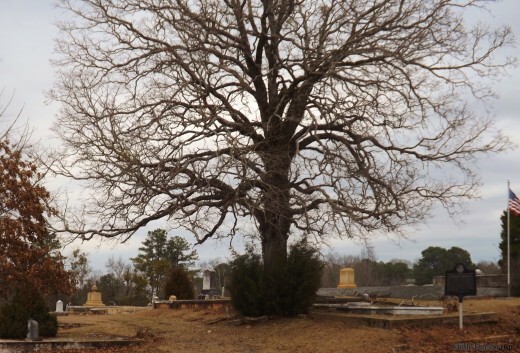 Update: 3/13/14 ~ The funeral home/cemetery scenes have aired! Here’s a behind the scenes look at the filming. And that concluded our planned self-guided tour. 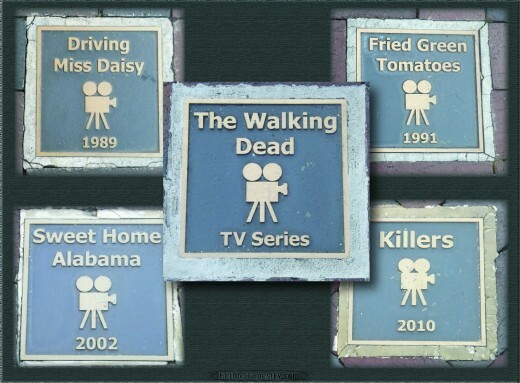 Our next Walking Dead film locations tour will be focused on first season scenes that were shot in Atlanta. 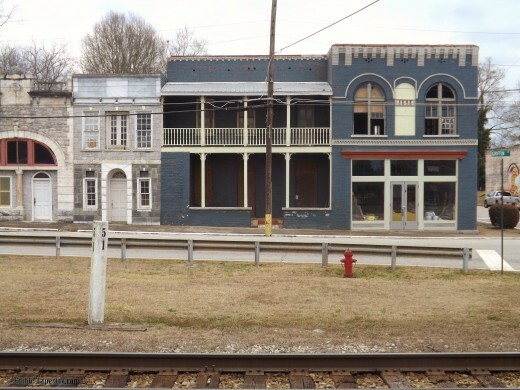 I get a lot of hits to this post via Google searches of the filming location of fictitious Terminus. I haven’t had the opportunity to take another film locations trip to the Atlanta area since my last visit in February of this year, but Terminus does appear on the updated Google Maps list of The Walking Dead Film Locations. 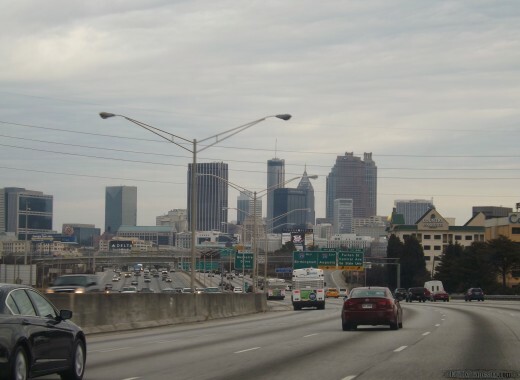 It is located west of I-85, across the interstate from Turner Field, near downtown Atlanta. It appears that it can easily be reached by exiting to Turner Field and going west on Ralph David Abernathy Blvd. SW. From there, one of several side streets can be taken south to the train yard. But as I said, I haven’t been to “Terminus”, I’m just using the Google Maps marker as a guide. 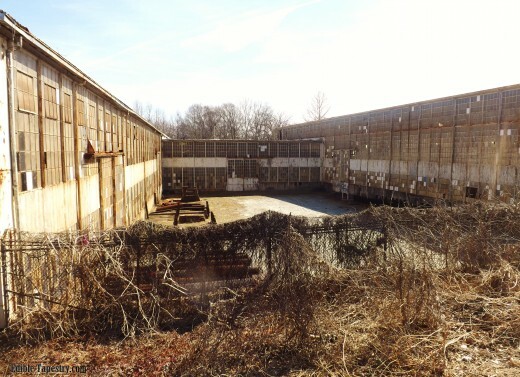 At this time, Terminus appears as the last listing in the map’s side bar of locations, as this was where the writers left our heroic survivors when Season 4 ended. I can’t wait to see it for myself. Exciting current film location news!!! 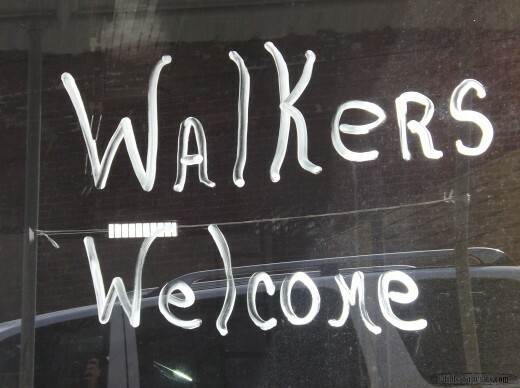 Julie from The Georgia Mercantile Company, a farmer’s market and purveyor of products made in Georgia, has informed me that The Walking Dead Season 5 film crew is building a set behind the store. 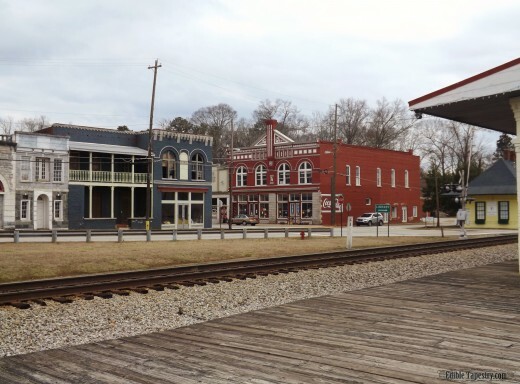 Filming at this location, in downtown Senoia, GA, is coming soon, for those of you who want to get as close to the action as possible, rather than just visiting and photographing past film locations. 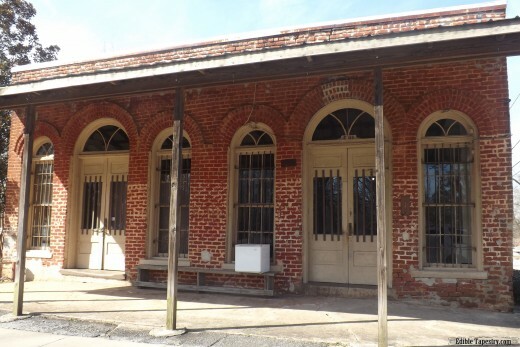 Look for the town’s post office to locate the store and soon-to-be film location. 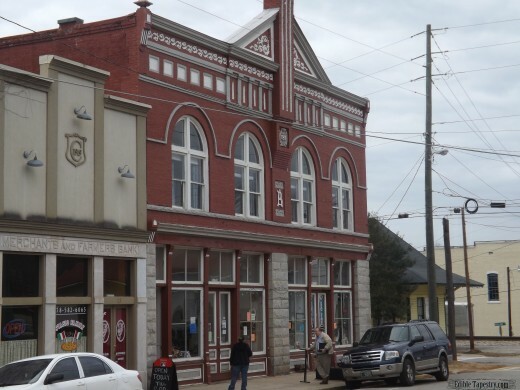 Tickets for a new Senoia TWD film locations tour can be purchased in The Georgia Mercantile store. That’s very exciting news since, as far as I know, there wasn’t an official walking tour of fictitious Woodbury when I visited with my family over the winter. You can also find more info. 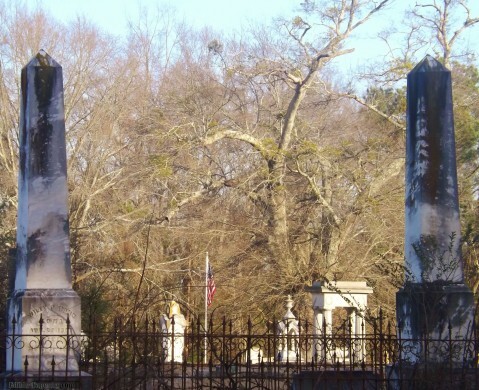 on the tour by visiting its Facebook page, Senoia on the Big Screen Walking Tours. 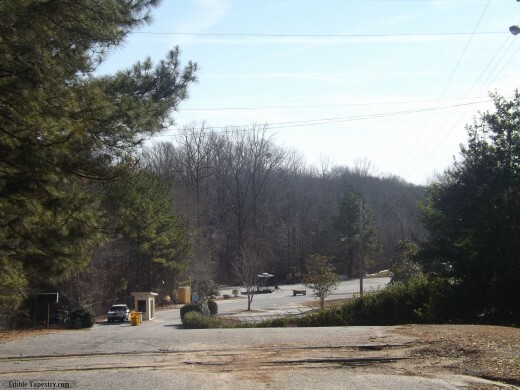 You can read Julie’s comments below this post, as well as a Terminus visitor’s experience. The buildings in the Beth hospital episodes are located near Jesse Hill Jr. Drive SE and Armstrong St. SE, in the block between Jesse Hill Jr. Drive SE and Pratt St. SE, according to the map. It appears to be accessible by taking the Edgewood Avenue NE exit from I-75, northbound, but I am only guessing since I haven’t yet toured to this location, myself. Walker fun! August 23, 2015. I met a real live walker today! 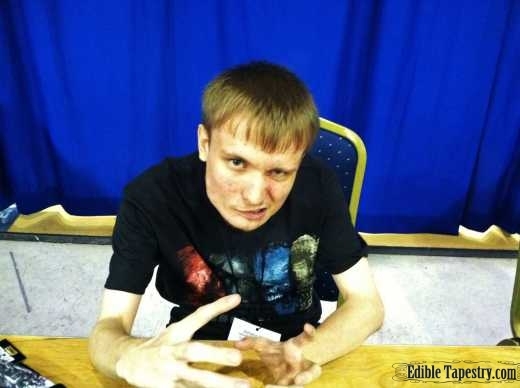 Jeremy Ambler of The Walking Dead Season 1 was a guest at WV PopCon, which I attended. Such a funny, sweet, inspiring guy! I really enjoyed talking with him about his career and flipping through his actor portfolio. TWD fans may recognize him as the herd leader in the interstate breakdown in Episode 1 of the 2nd season, in the scene that results in Sophia’s disappearance. Jeremy has also appeared in films, such as Killing Lincoln and alongside Viggo Mortensen in The Road, among others. Stop for an entertaining chat with this talented go-getter if he’s a guest at an event near you. 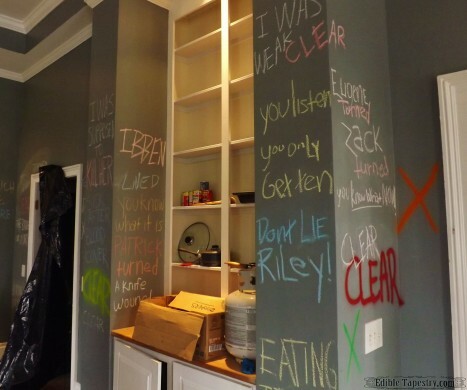 What a fun way to punctuate premier day of the new Fear the Walking Dead series! Fear the Walking Dead Premiere~ August 23, 2015 Whoa! What did you think, my fellow Dead fans? Give me your review of the new series in the comments section below. I’d love to know what other people thought of the first episode! Personally, I just couldn’t wrap my head around the fact that I was watching a TWD-related series. It felt more like a high quality zombie flick, such as World War Z— very well made, from filming to acting, to the spine-tingling musical score, reminiscent of the “Governor music” from the original series, that did a number on my pulse as I perched on the edge of my seat. I wasn’t left with the same sense of need-to-know urgency that I felt watching Rick Grimes adapt to the new world that had developed around him while he was in a coma in Episode 1 of the original, but it was fun to know ahead of time what the characters didn’t know and wait for their reactions to their own changing world. I think it’s going to be long week, waiting for Episode 2 to come around! This information in this article is false. Dawn is NOT the unofficial tour guide. Zombie Geeks in Grantville is the Official Grantville Dead Walking Store. It needs to be changed! I’m sorry, Marlene, if my personal opinion offends you. I visited from out of state with my family on Presidents’ Day and was drawn to Dawn’s store by the sign in her window stating that she had self-guided tour maps available for purchase. We were happy to see that a store in a small town was even open on a holiday, as we live in a town not much bigger than Grantville and know that that’s not always the case. We personally found Dawn to be very informative, extremely friendly, professional, and amusing. She gave us Mayor Jim Sells’ phone number, provider of the maps that were available for purchase in A New Dawn, Dawn’s store, so that we could arrange for a tour of the town. 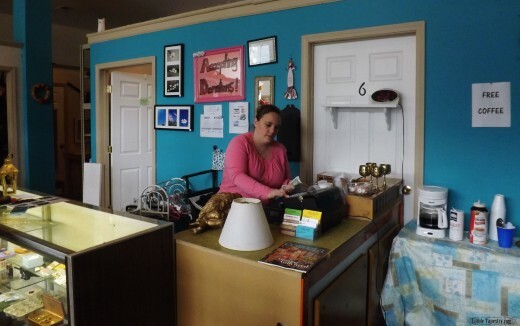 I affectionately called her “the unofficial tourism board director” of Grantville in my post because she was so helpful to my family that day when we pulled into Grantville and stopped by her shop, feeling like out-of-place tourists who needed a little information. I happily made changes to my blog post in an update the same day that I posted it when I learned that she is now the OFFICIAL Ambassador of Grantville, and has been asked to form a business association. My personal opinion of Dawn has not changed, so I will not be making any other changes to my blog post at this time. I apologize for having no knowledge of the store Zombie Geeks or its location. 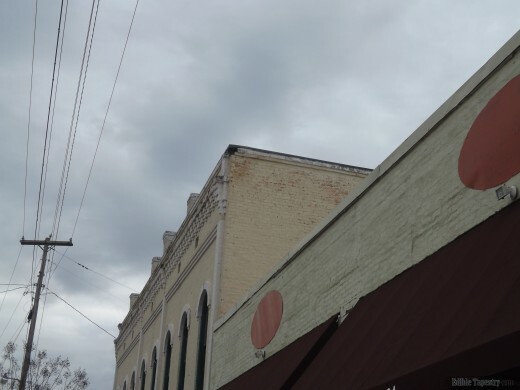 When I make it back to Grantville for pizza and meatballs, I’ll keep my eyes open for it and try to stop by for a visit to see if I want to include any information concerning the store in future posts of TWD film locations, since I plan to take other trips when Google Maps’ locations are updated as the series progresses. Thank you for visiting Edible Tapestry, my personal family journal, and for taking the time to read my post and to comment. I don’t need a chill pill… a portion of this article was forward it to me before I read the entire thing. I apologize for jumping to conclusions. No problem. I can understand that. Thanks for taking the time to comment. Marlene needs a chill pill! Loved the blog, the pics! Thanks for sharING your family vacation with us. You’re welcome, Stacy. I’m glad you enjoyed the post and pictures of our mini vacation! My boys are ready to go back and do it all over again when there are more things to see. Hi, Jamie. Thanks for visiting my blog and taking the time to read the post about my family’s little road trip. This post is a journal of the 1 1/2 day mini vacation I had the opportunity to take with my husband and two children this past month. We are very grateful that we had the privilege to see some of the locations where our favorite show was filmed and to head south and get away for a couple of days after being snowed in during our mountain community’s last major winter storm. The route we took was a great adventure for us, so I added directions to some of the locations we saw on our own personal self-guided tour in case anyone who stumbled across my blog and wanted to follow in our footsteps would have an easier time of it, and, hopefully, be able to skip some planning steps. If you are interested in learning about locations that we have yet to visit but hope to be lucky enough to see at some point in the future, you may find what you are looking for in the Google Maps reference I linked in the body of my post. Thanks for stopping by Edible Tapestry! 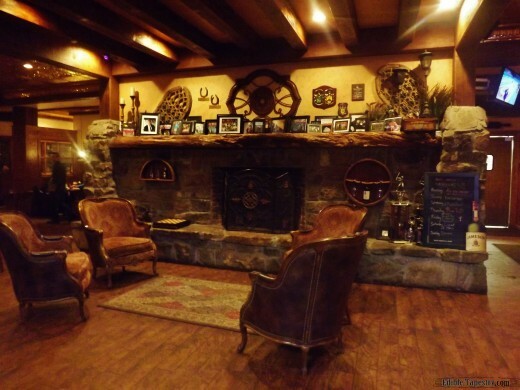 All the recreation of Morgan’s apartment and the soon to be recreated (for the second time) café, was done by Patrick, the owner of Zombie Geeks, and a few of his friends. Well, they did a great job on the apartment, so I can’t wait to see what they do with the cafe. And that’s the second time today that Zombie Geeks has been brought to my attention. I’m going to have to look it up to see what it’s all about. Thank you for this BLOG!! I am using it among other sites I’ve found to gather up info for our upcoming visit. 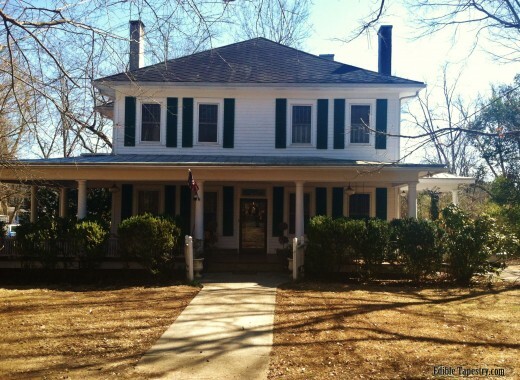 Do you know the street or address of the “funeral home” house? That’s the only location I can’t pinpoint on a map. Thanks for reading! I’m glad you found it helpful. The house is on Magnolia Ln. 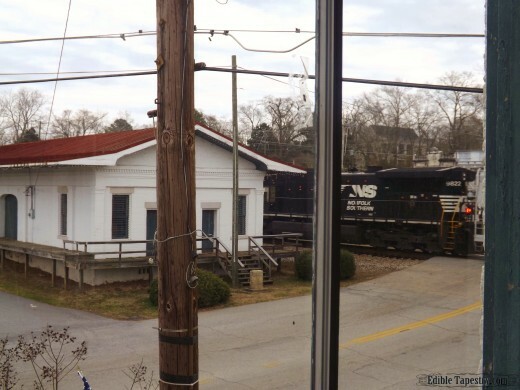 If you look at the picture in my post of the train engine that I took from the window of Morgan’s apartment, you can see the top of the house (“funeral home”) in the distance. It’s really close. I hope you have a BLAST!! Thanks for the great post. 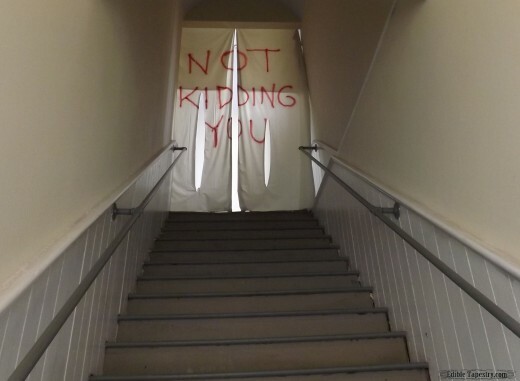 For our upcoming spring break, I was thinking about taking my boys on a Walking Dead Tour. We live in GA so I thought that this would be a great staycation activity for us to do. Again, thanks for sharing. Thanks for reading! I hope you have a great time. It’s so much fun! My boys are already trying to figure out the location of Terminus, after it was mentioned in last night’s Talking Dead. I believe they said it is being filmed at the site of an old round house. Google Maps already has some second half Season 4 locations updated. I guess we’ll be hitting the road soon too! I’ve saved for over 2 years to take my daughter from Maryland to Senoia, we leave tomorrow. I’m not very map literate, so your research and info will help to make this as fun and affordable as possible. In thanks to you, I wouldn’t dream of missing out on Grantville, or the shops you’ve mentioned. My girl is so thrilled to be going. As an autistic savant, she rarely finds an environment where she feels she belongs. The zombie apocalypse is, for her, the one place where every decent human is appreciated, welcomed, and of value. You are now her “great good friend”, because your blog inspired me to just.do.it. I can’t coherently express my gratitude to you, or my joy in her joy. A thousand times over, thank you. How exciting for the two of you! That is so true about TWD. What a great perspective! I think that people who don’t watch, and who assume that it’s just a gory horror series, miss out on so much. While I mostly find myself, as a sensitive person, watching through my fingers and truly freaked out by the gore of the show, it’s the living human factor that keeps me hooked. Such amazing actors and writers that make the show great! Terminus is difficult to pinpoint on a map; Google map “Collier Metals”. It is private property but the A car is visible from the street! Hi Ingrid. Just happened upon your blog after searching Google from a sales call. Your blog appears second in the list and therefore is getting a lot of traffic I suppose for Walking Dead Tour information. 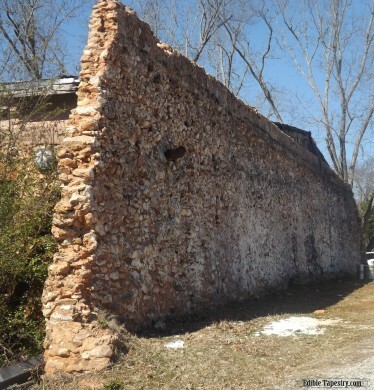 Since your visit in February, we have created a walking tour in Senoia. 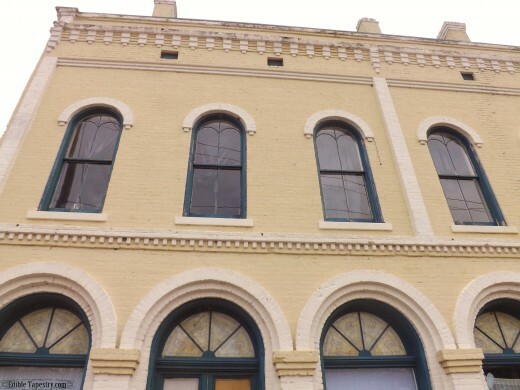 From The Georgia Mercantile Company location next to the post office, we show you around Seasons 3 & 4 locations in town with detailed information about the production activities. 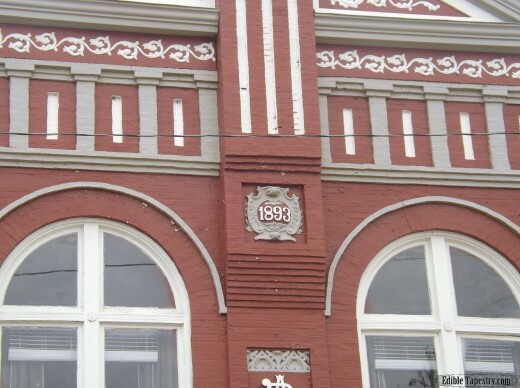 You may find more information about our tours on Facebook at Senoia on the Big Screen Walking Tour and/or make reservations at http://www.georgiamercantile.com. NOTE – the new set for Season 5 is under construction at this time and right behind our store. We look forward to their return very soon. Additional information about tours in the area can also be found at http://www.cowetafilmtours.com. Very exciting! Thanks so much for the info. I’ll add it to body of the blog post in case readers don’t make it this far down in the comments. 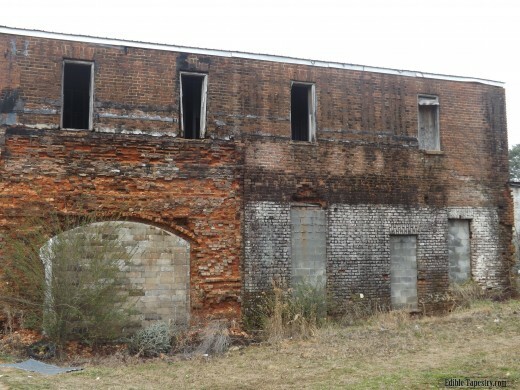 We really thought Senoia needed a walking tour when we visited, so this is so great to hear! Thank you, Ingrid! Please come back to visit soon. Loved your post! I am bookmarking your page on my computer and I’m planning to use it to help plan my own trip! Thanks so much for sharing! Hi Jennie. Thanks for reading. There aren’t exact addresses for each location. 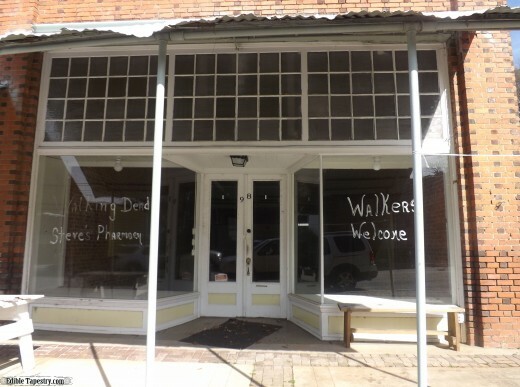 The best way to find locations is by using Google Maps’ The Walking Dead Film Locations. Then you can map out all of the locations you want to see, including the more recent, updated locations that Google adds as soon as a season has ended. It takes a bit of detective work and the use of a reliable GPS, but I really enjoyed searching for each location. I did a lot of planning before we set out, finding the best route to loop down from our NC home and then back up again. Once I knew the route we wanted to take, I used Google Maps to try to pinpoint each location and listed them in order along our route to make finding them as easy as possible once we were on the road. As soon as we’d finish one, I’d look for the road or crossroad on the map that would lead us as close as possible to the next film location and enter it into our GPS. Then we would visually search until we found it. Some spots are deep in the woods or in parks, so we skipped those, as we only had a day and a half to complete the trip. 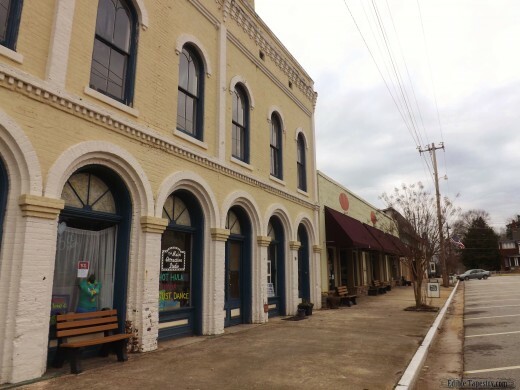 The Georgia Mercantile Co. in Senoia now offers walking tours of the town. That may be a good place for you start, especially if you only have one day for touring. I hope you have a blast! I’ve just moved much further north so am VERY jealous of your upcoming trip. 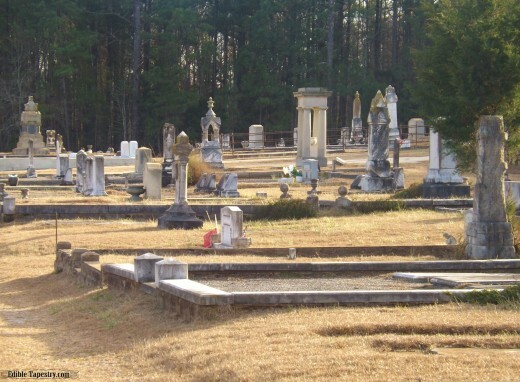 Hoping to make it back down to continue searching locations next February. And if you are “Big” fans, then I guess your head is still spinning from the tragic events of the mid-season finale, as is mine. Ugh. That one hurt!